A bullet is accelerated down the barrel of a gun by hot gases produced in the combustion of gun powder. What is the average force exerted on a 0.0300-kg bullet to accelerate it to a speed of 600 m/s in a time of 2.00 ms (milliseconds)? This is College Physics Answers with Shaun Dychko. A 0.03 kilogram bullet is going to be accelerated from rest to a final speed of 600 meters per second in the barrel of a gun in a time of two milliseconds which is two times ten to the minus three seconds. We're asked to figure out what force must the bullet be experiencing. 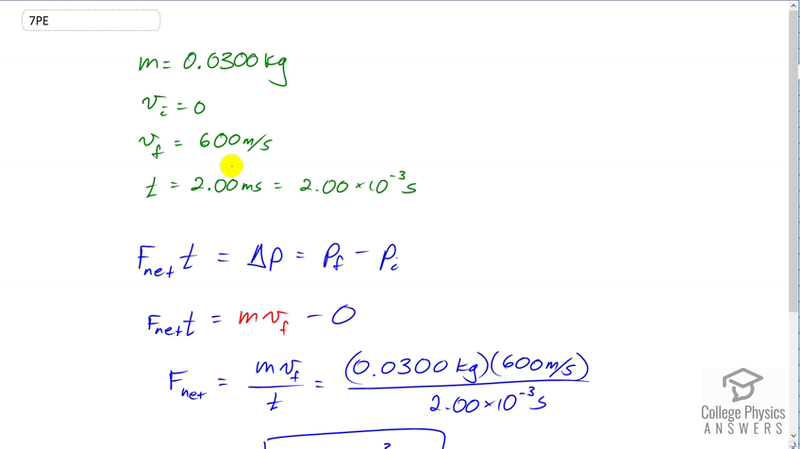 So we know that impulse which is the change in momentum, is the net force multiplied by time. The force that the expanding gas applies on the bullet is going to be the net force, it's going to be the only horizontal force on the bullet. So we'll solve for F net by dividing both sides by t , let's do it down here like this. The initial momentum by the way is zero. We substituted mass times final velocity in for final momentum and now we get the net force is mass times final velocity divided by time. So it's 0.03 kilograms times 600 meters per second divided by two times ten to the minus three seconds and that's a force of 9.00 times ten to the three Newtons.